Low liquidity and high complacency means things are about to get a lot more volatile on Wall Street, according to Morgan Stanley strategists. Market mover Marko Kolanovic is blaming a “negative feedback loop between volatility and liquidity” for the soon-to-be roiling market. A number of strategists have also voiced concern over the impact of low liquidity. Goldman Sachs Group Inc.’s John Marshall and Rocky Fishman warned in December about the risks of falling volumes and market depth. JPMorgan Chase & Co.’s Marko Kolanovic expressed concern this monthabout the negative feedback loop between volatility and liquidity. 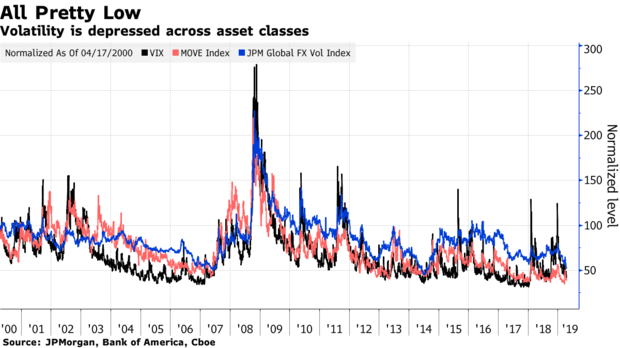 Investors may have gotten into the habit of selling volatility, which could be keeping some measures of it lower, according to Sheets. The strategist views 2007 as a cautionary tale for anyone who sees the world of low price swings as a time for complacency — that year too you had a very flat yield curve and low implied volatility.